You can create multiple views of an active report by binding an active report or active chart object to an active report. Binding or synchronizing is the act of configuring an association between an active report and an active report or active chart object in HTML Composer. You can synchronize active report and active chart objects and show the synchronized report groups in HTML Composer. The synchronize options are available from the Positioning toolbar in HTML Composer. Double-click the report object to create the active report in Report Painter. Right-click the report object and select Reference existing procedure from the context menu to add the active report. Select Import Existing Procedure from the Insert menu to add the active report. Add an active report or active chart object to the layout. Drag the crosshair to create an active report or active chart object and adjust it to the size you want. Select the active report or active chart object as the object to be synchronized. 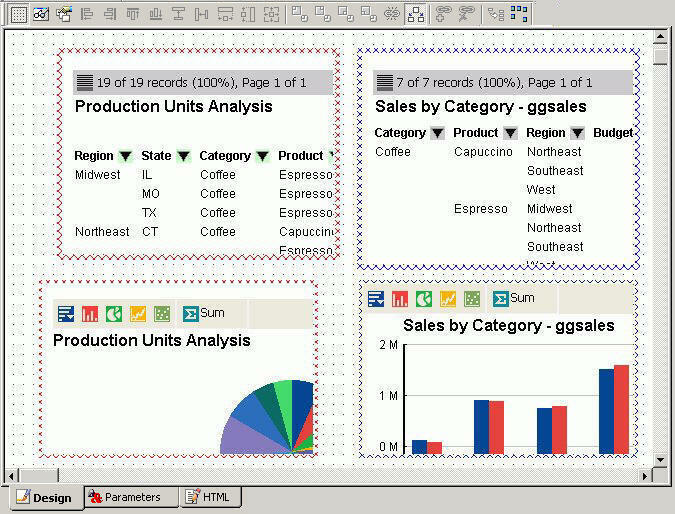 In the example below, the active report is the binding object and the chart object is about to be synchronized to the active report. The binding object (active report) is indicated by clear boxes around the edges. The synchronized object (active report or active chart object) is indicated by solid black boxes around the edges. Click the Synchronize to active report button on the Positioning toolbar. The active report or active chart object is synchronized and refreshed with data from the active report. Select Show synchronized reports from the Positioning toolbar. The synchronized groups are shown in the layout. In the following example, there are two synchronized report groups. The Production Units Analysis graph is synchronized to the Production Units Analysis active report, and the Sales by Category graph is synchronized to the Sales by Category active report. You can change the active report object properties by using the Properties tab in the Properties window. Select the synchronized active report object in the layout and click the Properties tab. 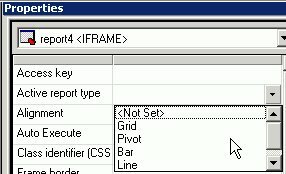 The active report object properties appear. Select the active report type drop-down list to change the type of active report for the object. The options are <Not Set>, Grid, Pivot, Bar, Line, Pie. Optionally, If you select Bar, Line, or Pie as the active report type, additional X-axis and Y-axis selections are available for the synchronized report. Select the active report X axis drop-down list. Select the active report Y axis drop-down list. If you change the X and Y values for a chart object, the selections are not reflected in the Design view of HTML Composer. These values are applied at run time. An active report object can only be populated if it is synchronized with an active report. 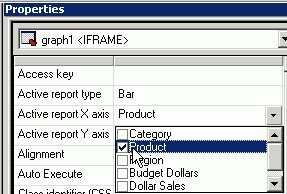 To break the synchronization between an active report or active chart with an active report, delete the object. Select the synchronized active report or active chart object in the layout. Click Delete from the Edit menu. The active report object is deleted.